If you have any questions please do not hesitate to contact us either by email on sales@ukchoiceshops.co.uk or call us on 0208 447 0163 and we will be more than happy to help. This Instillation requires the sink to be mounted into the worktop from the top. This installation type is suitable for all types of worktop including laminated chipboard. This instillation allows the top rim of the sink to be level with the worktop. 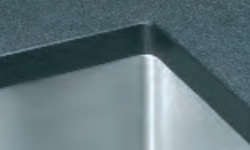 This instillation type is only suitable for solid surface worktops such as Granite, Marble or Wood. This instillation requires the sink to be fitted to the worktop from the underside. 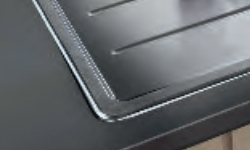 This instillation type is only suitable for solid surface worktops such as Granite, Marble or Wood. Heat Resistant - Stainless Steel is highly heat resistant, so much so that hot pans straight from the stove can rest safely on the sink. 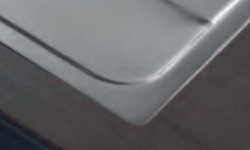 Hygienic - Stainless steel is a completely non-porous surface that is easy to clean and therefore more hygienic. Impact Resistant - Stainless Steel is the most forgiving material for impact and is the least likely material to damage your best china or glassware whilst remaining unscratched itself.